This project is one of the best of our projects that we designed. 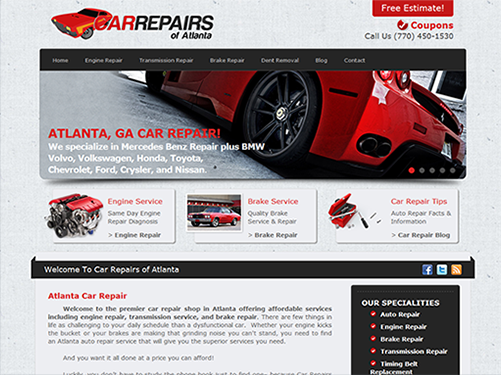 They are a car repair company from Atlanta, offering all kinds of car repair services. We worked with this customer to create their branding, with using new website and fresh corporate look. For this purpose we designed website and logo for their company, which represents their business. Website had to be more informational, like business card, where should be information about them, their work and services, so for this reasons we had concentrated, on making website with eye-catching design and good structured information. A first class, competitive service producing a professional web site. We have been impressed with the support provided by Volodymyr.